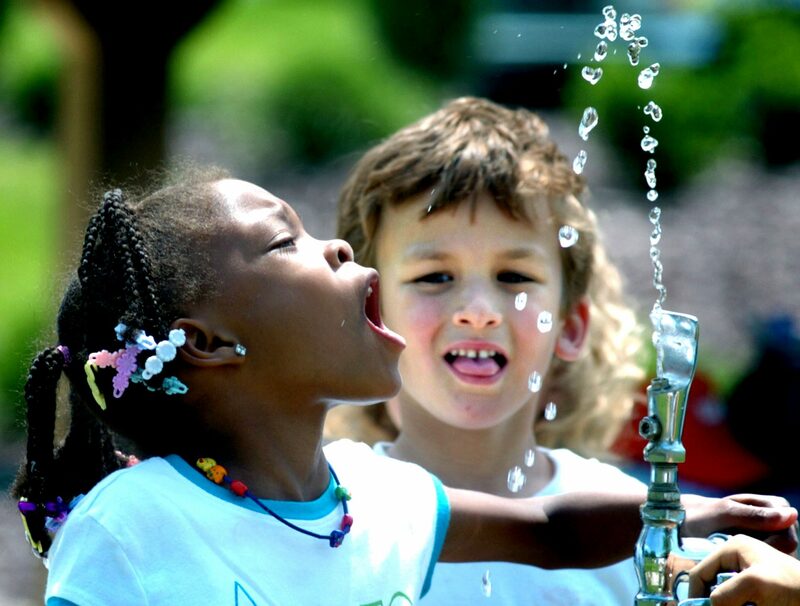 FILE - In this June 3, 2008 file photo, Liberty Valley Elementary School, then, kindergarten student Tianna Swisher moves into an arc of water for a drink at the water fountain at Montour Preserve, near Washingtonville, Pa. , while classmate Eli Zakarian awaits his turn. Consumers know less about the water they pay dearly for in bottles than the tap water they can drink almost for free because they're regulated differently, the Government Accountability Office and a group of scientists say in reports being released Wednesday, July 8, 2009. File Photo/June, 2008 Liberty Valley Elementary School students from Danville, Pa., drink at the fountain at Montour Preserve. A new report shows more than 3.4 million Pennsylvania residents are supplied with tap water that exceeds a strict California standard for radium. More than 3.4 million Pennsylvanians are supplied by drinking water containing radium that exceeds a strict California standard, which advocates say should replace a looser federal limit, according to a report issued on Thursday. Environmental Working Group, a nonprofit that advocates for clean water and other issues, said there were 466 Pennsylvania utilities where radium 228, a potential carcinogen, was above the California level when the water was tested in the first quarter of 2017. The state’s data are part of a report saying that 170 million Americans served by some 22,000 utilities in all 50 states are drinking water that contains radioactive elements at levels that may be hazardous to human health. Only a small percentage of water systems violated the U.S. Environmental Protection Agency’s legal limits for radioactivity, but nearly all exceeded much stricter guidelines for public health set by California’s Office of Environmental Health Hazard Assessment in 2006, EWG said. In Pennsylvania, only three water systems, serving about 3,200 people, broke the EPA’s legal limit of 5 picocuries per liter of water for radium 226 and 228 combined. Others met the EPA standard but were sharply higher than the California limits. The Pittsburgh Water & Sewer Authority, for example, was found to have an average radium level of 0.4 picocuries per liter, well above the California goals of 0.05 and 0.02 for radium 226 and 228, respectively, but within the federal limit. In Allentown, water supplied by the Lehigh County Authority averaged 1.8, while the Chester Water Authority reported an average of 0.042, according to EWG’s data. Pennsylvania had 560 water systems serving about 5.5 million people in which the two elements were detected at any level, the seventh-highest among the 50 states, according to the report, which used data from the Pennsylvania Department of Environmental Protection. Alexis Temkin, a toxicologist at EWG, said the California standards indicate that any higher radium level could be carcinogenic. Myron Arnowitt, Pennsylvania director for the nonprofit Clean Water Action, said the report is a reminder that sources of radioactivity such as frack waste should be kept out of rivers because of the health risks. “Any utility that detects radioactivity at any level is going to have some increased risk of cancer because there is no safe levels of carcinogens,” he said. EWG said EPA’s standard, first set in 1976 and then updated in 2000, was “inadequate” to protect people from an elevated risk of cancer and hazards to fetal development that may come from high radioactivity levels in drinking water. “Millions of Americans are drinking water with potentially harmful levels of radioactive elements but the outdated federal standards mean many people don’t know about the risk they face when they turn on the tap,” said Olga Naidenko, EWG’s senior scientist for children’s environment health, in a statement. Most radioactive elements in tap water come from natural sources, but regulators should still ensure that people are not exposed to hazardous levels, she said. According to EPA data, 91 percent of the U.S. population gets drinking water from systems that meet all health-based standards. Neil Shader, a spokesman for Pennsylvania’s DEP, said officials there are studying the EWG report.